Yes it is official. Archbishop Tagle announced in a Press Conference today that Pope Francis will visit the Philippines next year in January from the 15th to the 19th. Though the exact schedule of his visit is undisclosed at this time, it is believed that His Holiness would aim to strengthen and create a Spiritual Typhoon amidst all those who were part of certain calamities. The visit will coincide with the World Youth’s Day 20th year celebration which the Philippines has played a big part in supporting the Roman Catholic Church at this festivity through its Catholic Schools and Parishioners. 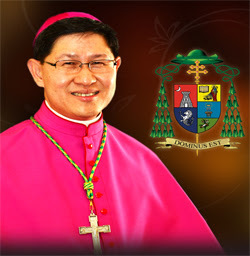 We are lucky that it has been a blessing to have a Papal Nuncio scheduled in less than a year. I remember that when Pope John Paul has declared before that he will visit us, it was years that we waited for his coming. Bishop Tagle would like to encourage the Filipino Catholic people to have a renewal of Faith and keep on returning to the Holy Sacraments.